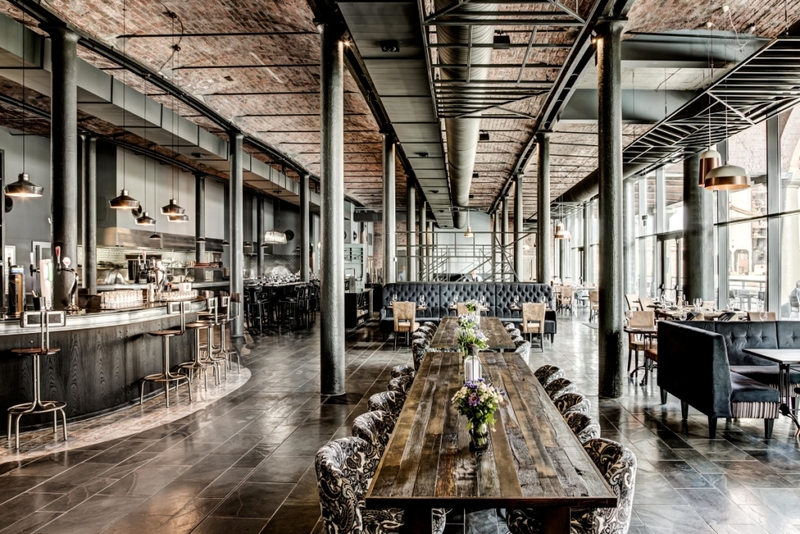 adi Studio was commissioned to create the interior design scheme for the conversion into a contemporary four-star hotel of a grade II listed Victorian brick warehouse in Stanley Dock, Liverpool, part of the UNESCO World Heritage collection of buildings in Liverpool. The first major design challenge was the vast spaces: ground and basement levels occupying 842sqm under a four metre high ceiling; and upstairs, corridors four metres wide, due to the layout of the structural cast iron colonnades of the building. A second challenge was the intermingling of two themes: the celebration of both the Liverpool link with the Titanic liner and a much loved historical building. The restoration transported the disused and almost derelict 19th century industrial warehouse into the 21st century by reimagining it as a contemporary four-star hotel and spa. An important aspect of the interior scheme was giving the guest a ‘sense of place’, so often neglected in modern branded outlets. Since opening in 2014 the project has won international recognition and awards: RIAI overall Interior Design 2014; Planning Excellence RTPI 2015; finalist in the International Restaurant & Bar Awards and the SBID Design Excellence Awards UK 2015; Civic Trust Award Commendation 2016; The Best Day Spa – Candis Spa awards 2015; adi studio is a group of commercial interior designers led by Maria Rice, Creative Director, who has spent over 16 years working in the commercial design industry, gaining expertise in hotel, bar and restaurant design. The studio participates in joint ventures with award winning architectural practices to produce consistently high quality schemes and detailed bespoke fit out packages.